As an economist, Roshen Kulwant is already making waves in the New Zealand industry. For his honours dissertation topic, he created an Economic Vulnerability Index (EVI) for the 16 regions of New Zealand. “An EVI is primarily used to determine which countries are most in need of international aid, but more research is needed when an EVI is used within countries. An EVI needs to be able to show how to effectively distribute aid and support through governmental policies. Since graduating, Roshen has worked on a number of projects helping New Zealand grow as an economy, including the 2016 review of the Government's retirement income policies. He currently works as an analyst helping New Zealand make funding decisions on pharmaceuticals. 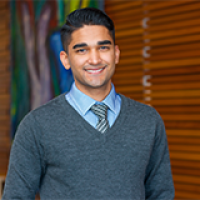 Roshen, who completed his Bachelor of Business (Honours) in 2017, says the opportunities at AUT are incredible. “Put yourself out there! There are awards and grants that get passed up if no-one decides to apply for them. Speak up in class discussions and a lecturer may remember you when a potential opportunity comes their way. Sign up for clubs and extracurricular activities which force you into situations which will grow you as a person. It can be a tough decision to decide on a university, so Roshen went directly to the source. “I sought advice from the then-current students before I made my application and all of the feedback was really positive. The students all said that AUT was a friendly and open environment where the lecturers are always willing to help with any issues you have regarding classes. I found this to be true.